The beautiful cast aluminum fences style which are suited for the villa, garden house, block house. Fences are a key component of the house. In addition to the factors ensuring safe homes and villas from external threats, as well as a barrier in the decision component, brings harmony, as well as more complete aesthetic elements for house. 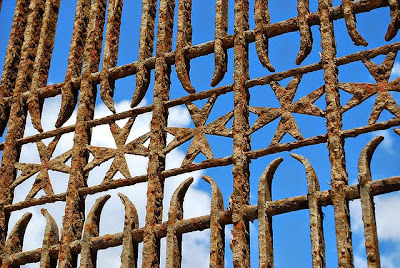 Fences become rusted metal after long time use. The following article sent to you some form of cast aluminum fence nice for you to choose from, both products have high aesthetics, luxury, fit with villa, luxury home, just make sure durability, good tolerance to the external environment is made ​​by casting aluminum material. Here is a sample cast aluminum fence is designed uniform, along with product use Immortal Portal villa gate. The highlight of this product is simple bar-like structure, in conjunction with patterned detail, build buzz for the project. Immortal Fence is one good choice for garden villas, compatible with the structure of the green house. This is a product that is synchronized sampler for cast aluminum gates Flower Garden. Products are designed to simplify details, just create the key highlights, bring out the harmony house. Robust fence is an aluminum casting products are designed in antique style. This product is suitable when used in conjunction with products villas gate aluminum castings of ASUZAC ACM. If you ever used over Gosanjo gate or Buckingham gate the style of Robust fence is a good choice. There are many casting aluminum products style from ASUZAC ACM. Wish you soon pick suitable products for your home. Villa Gates - How to choose material ?